I had parked the Hexa in the forecourt of a food joint on the Mumbai-Pune Expressway. As I walked out after a meal, I saw a swarm of people gathered around the new Tata, like bees around a honey pot. I've usually faced such a situation either with an expensive car or a superbike. That's the kind of curiosity and buzz around the new Tata Hexa. There's a lot riding on it as Tata is hoping to finally make a dent in the premium people mover space. 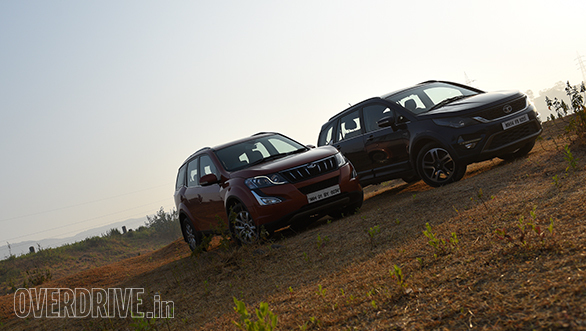 Or will the established and proven Mahindra XUV500 prove to be too tough an opponent to beat? The design approach of the Hexa and XUV is poles apart. While the Hexa looks like a beefed-up MPV, the XUV is styled as a butch SUV. The Hexa's design, however, is the more handsome of the two. Viewed head-on, the strong lines on the bonnet, wide grille and large air dam give it an imposing stance. The smoked headlamps look good too; however, the illumination provided solely by the projectors was inadequate in the dark. The lack of cornering lamps was also telling when I was driving in the ghats. The side profile is neat and simple, but there are a few interesting elements that keep it from looking slab-sided. What you cannot miss, though, are the large 19-inch alloys which look absolutely stunning. The rear end of the Hexa has a large chrome strip that integrates with the wrap-around LED lamps which look lovely in the dark. Overall, the Hexa looks premium and has massive road presence, a factor that makes it desirable in a way no MPV-shaped vehicle does. The XUV500, despite having been around for nearly six years, doesn't look dated thanks to the cuts, swoops and sharp crease lines. The front and side profile highlight its butchness, and the XUV is certainly the sportier of the two. But when it comes to road presence, a factor most Indians love about their vehicles, the Tata Hexa is the one that commands it since it's taller, longer and wider than the XUV. The bigger dimensions also mean that the Hexa is a bit roomier. 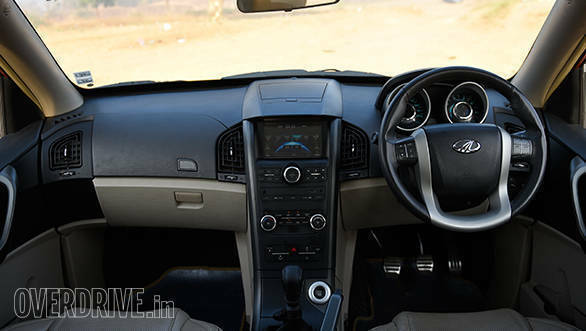 Open the door and you are greeted with a dashboard that looks and feels far more premium than anything that has worn the Tata badge. The soft-touch plastics, damped-out switches, leather-wrapped steering and chrome accents lend the cabin an upmarket air. 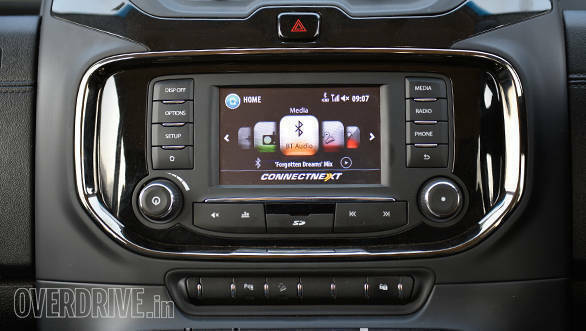 Complementing this is the awesome Harman infotainment system with 10 speakers by JBL, surely one of the best in an Indian car. The seats, meanwhile, are a bit on the firmer side but extremely comfortable and supportive which makes it well-suited for long stints behind the wheel. The middle row is quite spacious and seating three adults abreast should not cause a fight for shoulder room. That said, the high transmission tunnel eats into the legroom for the passenger seated in the middle.The last row has decent amounts of space, and you can actually seat two average-sized adults without them feeling claustrophobic. All told, while the cabin is a new high for a Tata, there are a few issues. For a people mover of this size, there should have been more stowage spaces all around. Then there are oversights such as the steering wheel that only adjusts for rake. Since this is a fairly tall dashboard, the AC temperature readout sits too far below, so when you are driving, you're unable to see the top half of the numbers. 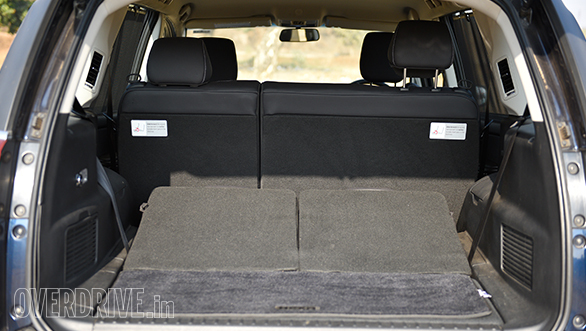 The XUV's interior is better in this regard as there are thoughtfully designed storage spaces around the cabin. The twin gloveboxes, for instance, are big enough to store a laptop. Additionally, there's a cooled central box that's placed between the front seats and a neatly integrated storage bin on top of the dash. 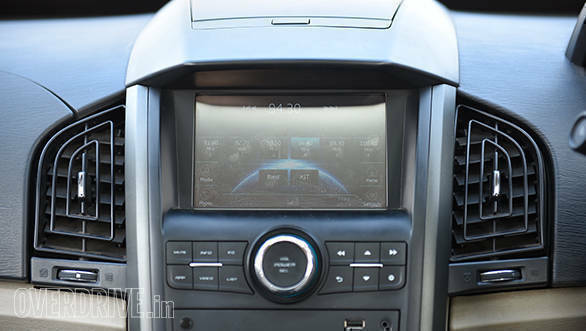 The only concern with the XUV's interior is the choice of materials. The buttons, switches and lower half of the dashboard feel too plasticky and are not what's expected of a vehicle at this price point. 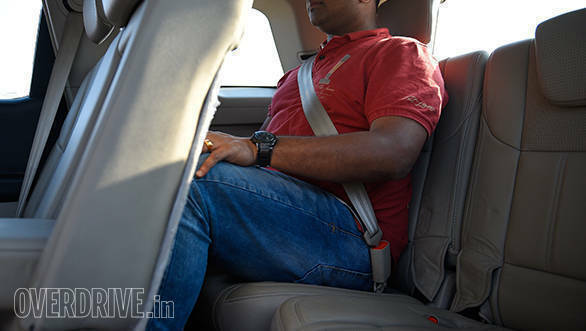 The six-way electrically adjustable front seats are wide and comfortable, but a little more under-thigh support would've been welcome. 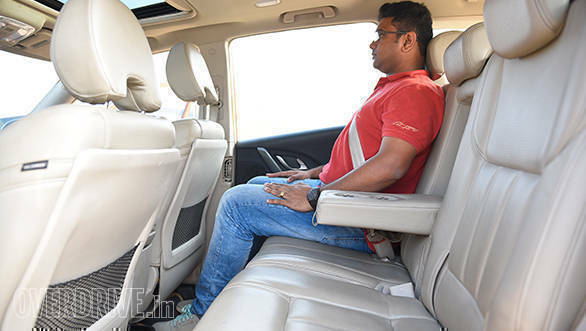 The XUV's second row, however, offers a little more legroom than the Hexa's, and the nearly flat transmission tunnel is a boon for the passengers. The third row though is cramped and best suited for kids only. 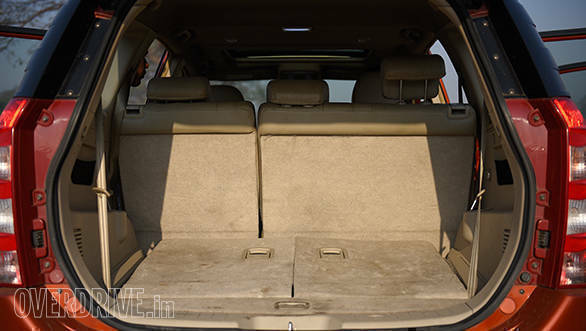 Overall, it's a nice and airy cabin owing to the generous use of beige as well as the large sunroof which the Hexa does not get. 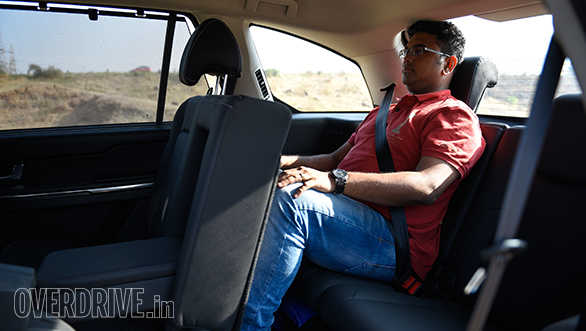 However, the XUV's cabin cannot match the premium feeling that you get in the Hexa. However, the latter has a wider boot and can accommodate more luggage. 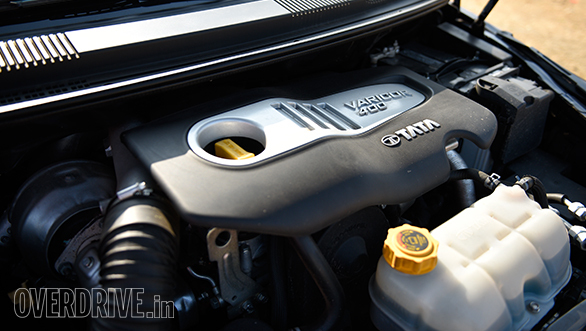 The Tata Hexa gets a 2.2-litre diesel motor that's available in two states of tune. In the base XE trim, it produces 150PS at 4,000rpm and 320Nm between 1,700-2,700rpm while the Varicor 400 engine in the mid- and top-spec Hexa develops 156PS and 400Nm, at similar rpms. 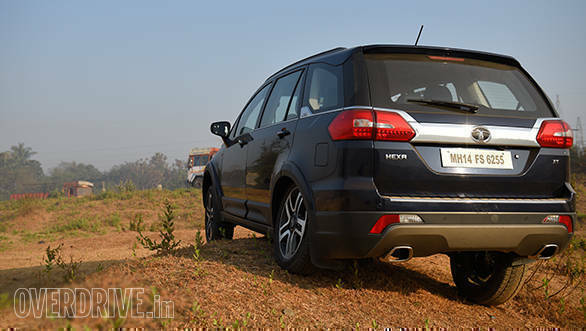 The Hexa's motor feels like a proper old-school unit which is evident in how slowly the revs rise and fall. The motor is refined but despite there being a variable geometry turbo, there's noticeable lag below 1,800rpm. However, once the rev needle is past that, there's a big boost in torque and the Hexa surges ahead, gathering pace quite rapidly. Keep it in the meat of the power band and you barely have to make any gear changes  be it in the city or out on the highway. 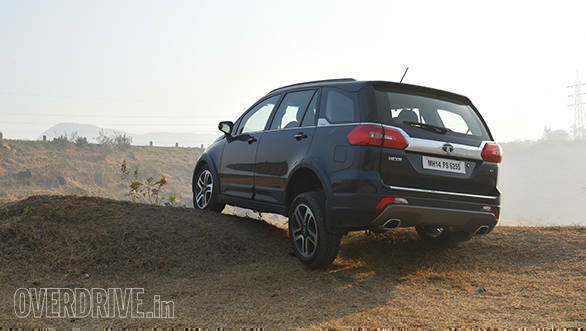 The ample amount of torque also means the Hexa won't be left gasping under full load, when driving up a mountain road. 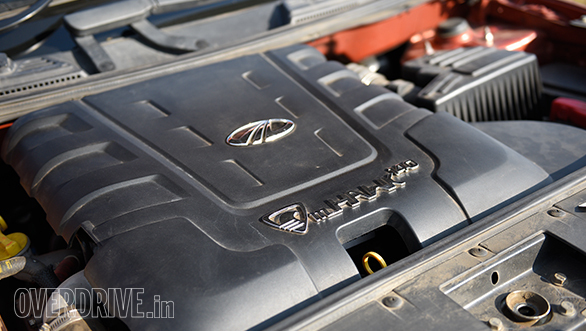 For those interested in performance numbers, the Hexa manages to complete the 0-100kmph dash in 15.2 seconds. What I didn't appreciate is the rubbery gearbox with really long throws. 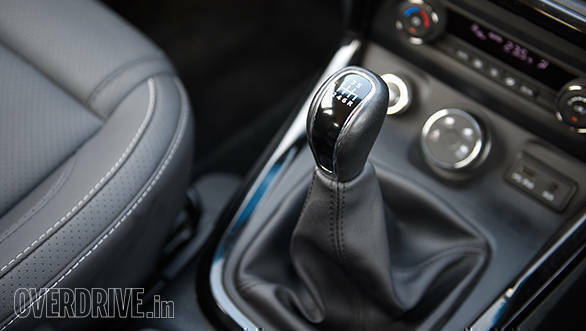 Factor in the long travel clutch pedal too and it soon turns out that driving the manual transmission Hexa in crowded cities takes some effort. The Hexa is primarily a rear-wheel driven vehicle, but you can opt for the optional 4x4 system by Borg Warner, available only in the manual XT trim that you see here. 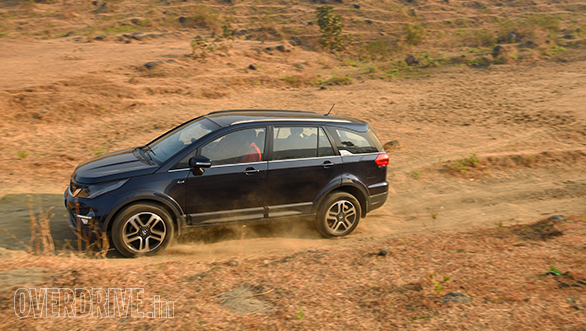 In addition, the Hexa also gets four drive modes  Auto, Comfort, Dynamic and Rough Road, which is also standard in the mid- and top-spec manual transmission variants. Switching between the modes alters the throttle maps and the ESP. Since the 4x4 system has a single ratio, there's a torque on-demand type transfer case. What that essentially does is sends torque to the wheels with maximum traction. 4x4 is only available in Auto and Rough Road modes. Comfort mode dulls the throttle response quite significantly and is useable in chock-a-block traffic or when you want to extract the best possible fuel efficiency. 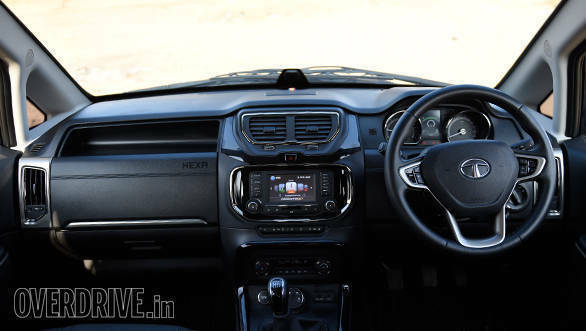 I, however, enjoyed driving in the Dynamic mode in which the Hexa feels a lot more eager and responsive, owing to more torque in the mid range. The XUV's 2.2-litre motor, on the other hand, produces 140PS at a slightly lower 3,750 rpm and 330Nm between 1,600-2,800rpm. It is a much more modern and refined engine. 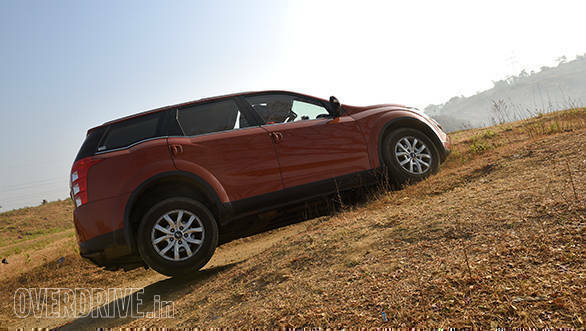 On the move, the XUV's motor revs quicker and feels far more eager to throttle responses. All that torque down the rev range also means you have better driveability in the city, and cruising at 40kmph in fifth gear is easy. 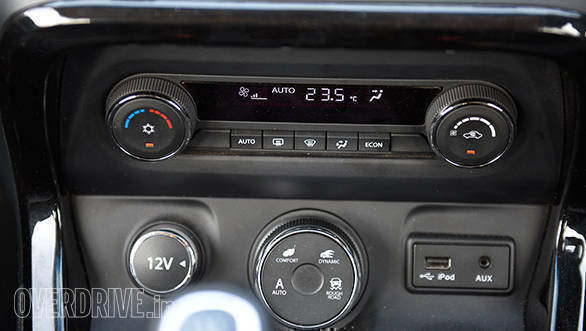 The XUV's gearbox is smooth and precise and it feels like a hot knife slicing through butter. It's a phrase that we usually refer to when describing gearboxes in most Japanese cars, but that's how much better the gearbox really is. The XUV's AWD system, by default, sends torque to the front wheels only, unless it detects loss of traction at the rear, which is when it sends power to the rear wheels. There's also an AWD lock mode that sends a fixed amount of torque to the rear wheels. That does alter the handling characteristics of the XUV which I'll come to a little later. At 13.1 seconds from 0-100kmph, the XUV is the quicker vehicle of the two. 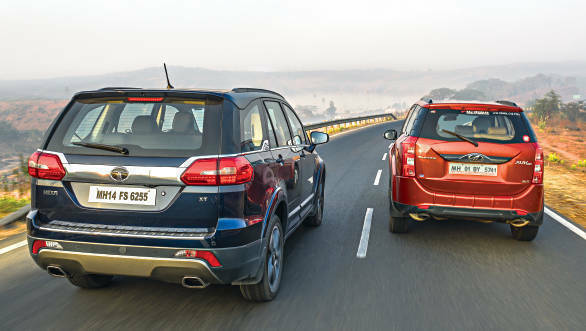 But given the fact that the Hexa is a lot heavier than the XUV500, its performance figures are respectable. The Hexa does have the upper hand in terms of fuel economy, returning an impressive 13.2kmpl in the city and 17.2kmpl on the highway. The XUV500, on the other hand, delivers 12.5kmpl in the city and 15.9kmpl on the highway. 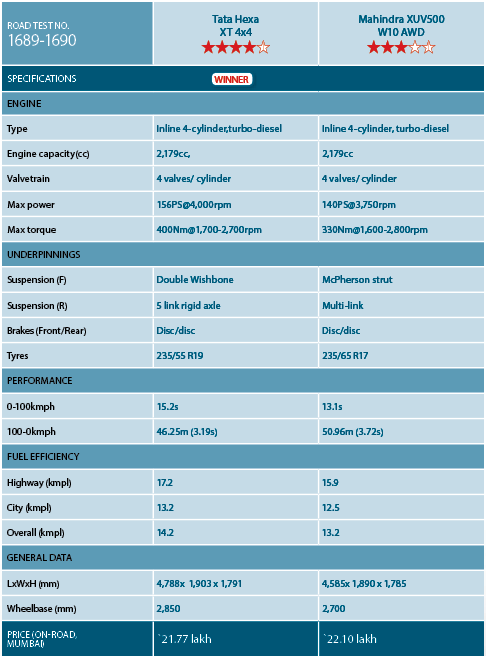 For a fairly heavy vehicle, the Hexa's fuel efficiency is pretty good. 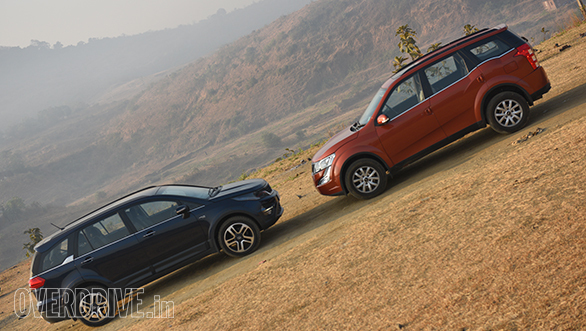 Just like the design, the Hexa and XUV have completely different set-ups. While the former has a rigid, ladder-frame construction, the latter is a monocoque like every other car. The Hexa's chassis and suspension are tuned on the stiff side, and low-speed ride, as a result, is not a strong point. Pick up the pace, however, and the Hexa simply glides over everything in its path. The way it gobbles up potholes and small speed breakers is quite astonishing, and what amazed me is the composure while it does so. The Hexa does not roll or pitch in a manner that'll have passengers close to spilling their last meal all over the cabin! The suspension also works silently which makes the Hexa an extremely comfortable vehicle to travel in. While this is a people mover, it is also up for some fun in the corners, which is where the real benefits of the firm set-up manifest. Around a bend, the Hexa remains planted and sticks to an intended line while at the limit there's a faint tyre squeal but no understeer. The Dynamic mode keeps things interesting as the ESP kicks in only when you push the envelope a bit too far. The steering, though, is on the heavier side which is good for feedback but not so great while parking or making tight U-turns. The XUV's suspension is tuned towards the softer side, which translates to better low speed. However, it's the large potholes that tend to unsettle the XUV, and enthusiastic driving will leave passengers feeling a little uneasy. On the limit, understeer sets in. The XUV is a lot more controlled if the AWD lock mode is engaged. The torque going to the rear wheels gives you much better drive out of corners, and I'd recommend this mode in the twisties. While it's a given that most owners are not going to push these big vehicles around corners, but it's good to know that they are capable of getting around one without any cause for worry. When you drop the anchors, the Hexa's brakes offer better feedback than the XUV's and that shows as the Hexa comes to a standstill from 100kmph in shorter time, 3.19 seconds. The Hexa is also far more capable off-road. The Hexa's Rough Road mode distributes torque more precisely to the wheels with maximum traction, helping it tackle mud banks or while driving up a slushy path. The axle articulation range is also much more than the XUV's and when you consider the generous 200mm ground clearance, you have a decent off-roader in the Hexa. The XUV's AWD system is most helpful on slushy or sandy. 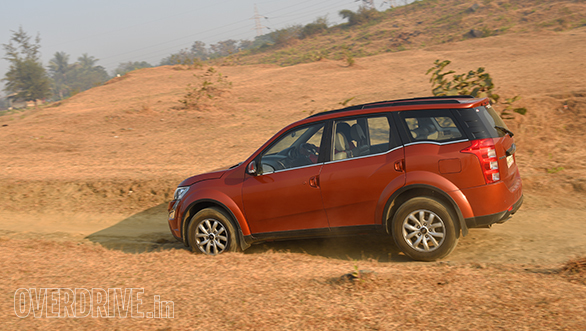 The Mahindra XUV500's light steering, nimble characteristics, smooth engine and gearbox make it the better urban SUV. Yes, the interior quality is a bit of a let-down, but there's no arguing with the fact that the XUV500 is a proven product. 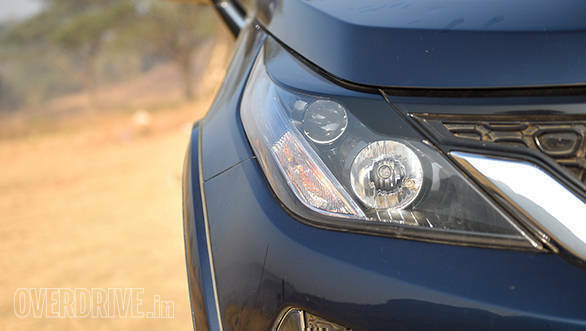 However, it has to concede the top spot to the Tata Hexa. 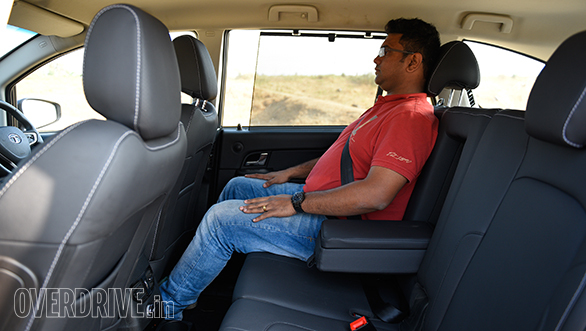 The Tata's design, interior space, useable third row, strong engine as well as the plush ride make it the better package overall. While we can't speak for longevity yet, the Hexa also makes for better value at Rs 21.77 lakh (on-road, Mumbai) for this variant, which is Rs 33,000 cheaper than the XUV500 AWD.